Receipts have usually a line by line format, very similar to tables. Other document types like invoices, contracts and more also follow the same layout. For all these documents we recommend that you enable check the Receipt scanning and/or table recognition option on the front page. If you use the OCR API, you get the same result by turning on the receipt scanning mode. The result is that the OCR'ed text is sorted line by line - just like you find it on your receipt. This makes the OCR API the perfect receipt capture SDK. 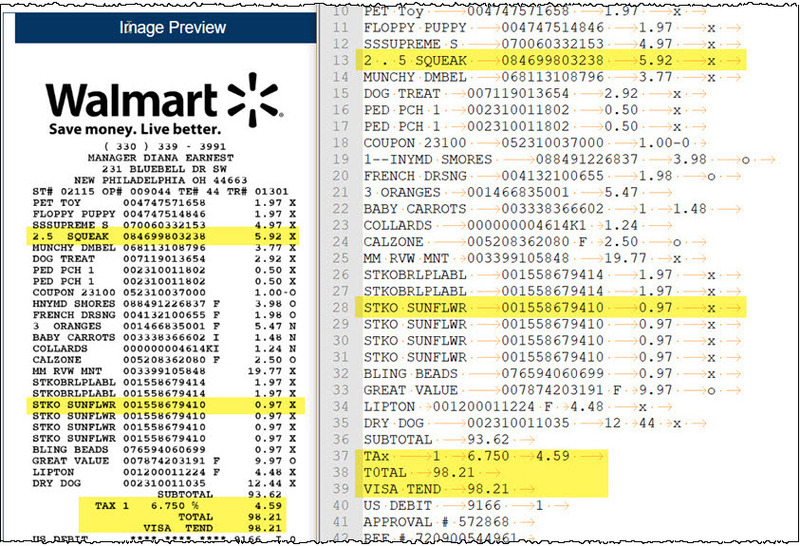 The screenshot below shows the OCR result of a scanned Walmart receipt. The structure of the text output is the same as on the receipt. We highlighted a few lines in yellow to visually help with the comparison of the left input image and the OCR text result on the right. The link to the Walmart receipt image is https://ocr.space/Content/Images/receipt-ocr-original.jpg - just paste it into the URL box on the front page.